A cowboy boot-wearing Rep. Stewart offers 'nebulous' answers during town hall. 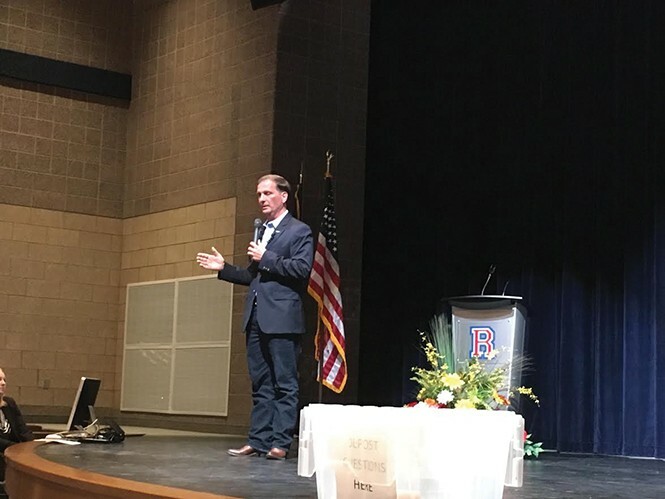 Rep. Chris Stewart's town hall meeting on Friday, May 12, in Richfield was subdued compared to the raucous crowd that confronted him in Salt Lake City last March. Stewart, one of the few members of Congress to hold town halls, spoke to a couple hundred people at a high school in a small Sevier County community. He answered questions for some 40 minutes. Unlike his event in Salt Lake City, here the majority of the crowd supported the Republican, who wore a pair of cowboy boots that weren't purchased in New York City, he assured the audience. The room, however, was not without opponents or outbursts. One of the first to call out Stewart was Mark Bailey from Torrey, Utah. He told City Weekly afterward that he thought Stewart was lying about provisions in a new health care bill, and he had a visceral response that he couldn't contain. Stacy Stanford, who traveled down from Salt Lake City, also challenged Stewart's explanation of the GOP health care plan that was narrowly approved by the House and is awaiting Senate action. "He needed to be held accountable for a vote that could kill people, and he wasn't," she said. Critics of the bill say it will leave millions of Americans uninsured, shrink Medicaid and price out folks with pre-existing medical problems. As people started to boo, they were shouted down by supporters, who yelled things like, "This isn't Salt Lake!" and "Let him speak!" The meeting was disruption-free from there on out. After the event, Bailey engaged in friendly chitchat with C.R. Wood, a local wearing a large cowboy hat. Wood drove 7 miles into town "to act as the counterbalance against the highly vocal minority who would not allow him to speak" at the Salt Lake City town hall, he said. Although Wood supports Stewart, he was a little disappointed with the audience's questions. He said too many were "nebulous" and didn't touch on specific policy decisions. The last questioner, Nancy Schmidt, for example, stated that she supported President Trump and hoped the Republican Party would find a way to unite. "I think President Trump will surprise us at the end of four years with what a great president he turns out to be," Stewart responded. Wood believed the "most cogent question of the night" was asked by Tyrell Aagard, a young Democrat from Salt Lake City, who asked about Trump's firing of FBI Director James Comey. "Would you support the appointment of an independent prosecutor?" Aagard asked. Stewart, a member of the House Intelligence Committee, said he's open to suggestions, but added that, along with investigations by the House and Senate, an independent prosecutor might be redundant. "As for Mr. Comey, I think he's lost the confidence of people on both sides of the aisle," Stewart said, echoing what's become the standard GOP response. Another man, who said he recently moved to Utah and was laid off from his job at a coal mine, asked Stewart about the "war on coal." Stewart said he wants to protect the environment, but the country isn't at the point where it can switch over to renewable energy. "If the market kills coal, there's not a thing in the world I can do about that," he added. "What I don't want is for the government to kill coal." A rancher and former helicopter pilot in the military asked why Congress was trying to repeal the Affordable Care Act instead of improve it. Stewart said the new bill includes ACA provisions, such as the part that allows young people to stay on their parents' insurance through age 26. A registered Republican from Cedar City wanted some assurance that policy would be based on scientific data. She also asked about Trump's proposed budget that would gut the Environmental Protection Agency. Stewart responded that, because EPA decisions are made thousands of miles away, there is less accountability. He wants some of the agency responsibilities to be transferred to Congress. "At the end of the day, if you guys don't like me, you can vote me out of office every two years. I have to come back and justify the things I've done to you," he said. "EPA administrators don't. They don't have to come here and justify what they've done. We have too many people sitting in cubicles in Washington, D.C., who have never set foot in Utah and will never set foot in Utah and are making decisions." Aagard lamented the long drive to Richfield, and said it was unfortunate that his congressional district swallowed up disparate parts of the state. Stewart, like other Republicans quoted in last week's cover story, said progressives want lawmakers to carve out a Democratic district, which would be gerrymandering. Stewart began the Richfield meeting by talking about the threat posed by North Korea if it were to develop a nuclear missile that could reach the U.S.
As he walked off the stage, several people shouted that they still had concerns that went unanswered.